Habitat: Grows together with Echinopsis spec. HU 87 and N. ottonis HU11a among grasses and Bromelia sp. partly among larger rock fragment in the crevices and niches. Stem: Cylindrical, 3,5-7 cm in diameter, 6-10(-15) cm tall, epidermis dark green concealed by the dense spines. Ribs: 21 to 27, approx 5 -7 mm wide and 2-4 mm highly, arranged into tubercles, on which the areoles sits. Areoles: Roundish, 2-3 mm in diameter, very close one to each other (approx 2 mm apart), filled by white wool that persist for some years, then naked. Annual increase 5-6 areoles per ribs. Spines: Very dense white and copper coloured, not stinging. The spines in the blooming areoles are often darker. Radial spines: 40 - 50 up to 7 mm long, very fine, pure white, lying close, radiating, interlacing with the spines of the adjacent areoles. Central spines: 4 – 8 (of which 4 true centrals and 3-4 intermediate), up to5 mm long, Longer and stouter, spreading, copper-red or brown. The central spines often are not present in the new apical growth but appears later. Flowers: Opening at the top of the stem, approx 35 mm long and 40 mm wide, sulphur-yellow, odourless, self sterile. Tube: 12 - 15 mm long, funnel-shaped, diameter at the base 4 mm, above 13-15 mm Ø, with yellowish epidermis, completely covered by wool and red-brown to dark-brown bristles up to 10 mm long. Stamens 7-9 mm long, golden-yellow. Petals: lanceolate to narrowly lanceolated, up to 4 mm wide and 21 mm long, inside and outside sulphur-yellow, shining. Stylus: 17 mm long, 1.2-1.5 mm Ø, dark-carmine, with 11 (12) stigma lobes up to 3.5 mm long. Blooming season: Summer. The flowers pen on the late morning and close at night. Fruits: Small 6-7 mm broad and long, fleshy, pinkish, cover with white cotton wool, drying yellowish, irregularly opening with the releasing of part of the seeds to the ground (but some of the seeds remain on the plant). Each fruit contains approx 80 seeds. Seeds: Helmet-shaped, black. Length 0.65 mm, width 0.5 mm, height of 0.4 mm, Hilum oval, curved, light brown. Testa convex to hemispherical, bordered with 5 to 7 adjoining cells, 0.03 - 0.07 mm Ø. Microphylar hole 0.13-0.1 mm Ø and 0.04 mm. 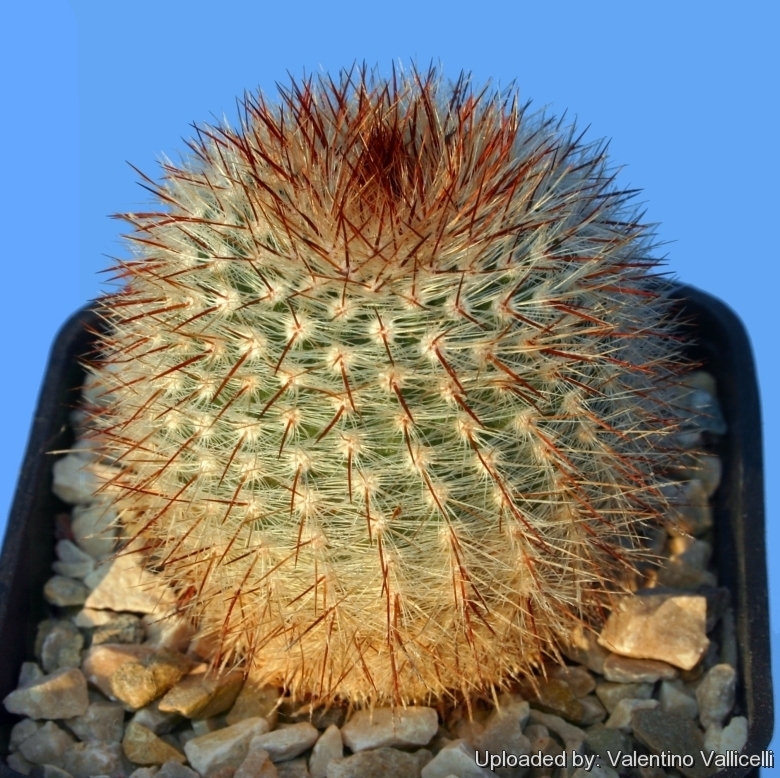 Notes: The Notocactus scopa aggregate is an ensemble of related species. This plant has been Transferred to Parodia in 1997 by David Hunt. Cultivation and Propagation: This is an easy plant to cultivate. It require a mineral-based potting mix with a good drainage. Can support quite some water during the growing season but pot plants in winter are wet-sensitive and needs to be kept dry (rots easily if soil is wet and cold). Usually it is recommended to over-winter this plant in a bright and warm greenhouse with at least 8-10° C , but it has proved to tolerate temperatures as low as -5° C for short periods.